Congrats to Karen who won a signed copy of VINTAGE from Susan Gloss! Lori Rader-Day guest posted at The Stiletto Gang and went a little rock’n’roll. Natalia Sylvester was featured in the May/June issue of Writer’s Digest magazine, in their “Breaking In” section! She talks about her road to publication and what she learned along the way. You can check it out on newsstands now. 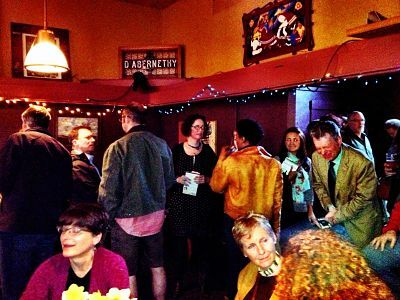 Lisa Alber‘s KILMOON launch party (and after party and after-after nightcaps) was a great success! Tons of books sold and signed, Kilmoon Sours flowed, and fun was had! Heather Webb jumped for joy when not one, but TWO photos of BECOMING JOSEPHINE surfaced on “staff recommends” tables at Barnes and Noble in California and Illinois. Susan Gloss took a lot of naps this week, recovering from last week’s launch of VINTAGE.